Mattresses for RVs aren’t things you can easily research on the internet or shop for at your local mall. At the same time, they are very important to own if you are using your RV and need a place to sleep. Yes, there are mattresses made specifically for RVs, and whether or not you are looking for your first mattress, or want to find a new mattress, you can find one that is considered a large upgrade in terms of support, comfort or both. In this review, we will take a look at five great queen size short mattresses for RVs. These RV come from companies like Zinus, Parklane and Premier Sleep Products. Each of these mattresses have great features as well as a one or two things that need improvements. But without further ado, here are the mattresses that we will be examining on your behalf. Active charcoal for disposal of bacteria. Doesn’t skid as you sleep. Has a comfortable top layer. Comes with a ten-year warranty. Zinus does specialize in bedroom mattresses, and they are great to use, but they also make short versions for use in RVs, trailers and campers. This mattress has three layers to it: five inches of support foam, two inches of comfort foam and three inches of memory foam to give you a hybrid of comfort and support. Not too soft and not too hard. This is a spongy-feeling mattress that springs back after you sleep on it. To keep the mattress fresh, natural plant oil replaces petroleum, a common ingredient in mattress-making. This also makes the mattress eco-friendly as not many man-made materials were used to design it. The green tea and charcoal is what set it apart from other mattresses. The green tea extract is meant to heal your body of toxins so that you can feel better as you sleep in more ways than one, as it works to rid toxins from around your body. The “ActivCharcoal” helps to limit bacteria as well, so not only do you sleep cleaner, but your bed will be less likely to grow and develop mold and/or mildew. This is important, especially when your mattress is travelling with you. The ten-year warranty is phenomenal. This is a long period of time for you to check any manufacturer defects, and it really gives customers more incentive to make the purchase. One one think to watch out for is the smell. For the first few months, your RV will start smelling unpleasantly. This is the only thing, however, that you need to worry about. Removes toxins around your body. Charcoal keeps bacteria from building up. Mattress may smell in first months of use. Next is this RV mattress from Serenia, it is also a short queen mattress that is 75 inches long by 60 inches wide by 8 inches tall. The mattress is made up of two layers. The bottom layer is a six-inch high density support layer, giving you a solid and firm foundation to rest your body on. The top layer is a two-inch memory foam layer for pressure point relief. This is a hypoallergenic memory foam that is used, making it strongly resistant to dust mites and other allergens. It does state that there is a warranty, but the duration of the warranty is uncertain at this time. The warranty only covers manufacturer defects, and if you happen to get a mattress that has one, you can get it replaced. The knit cover that serves as the mattresses outer layer is nice to the feel. It feels like a premium mattress without a premium price. This would be a pleasant surprise to experience in the RV. This mattress would be useful in really warm summer nights. The memory foam works to keep you cool so you aren’t sweating until morning. This is a mattress that might not age well. Over the course of a year, it will start sinking in the middle, making for rather an uncomfortable night’s sleep rather than a comfortable one. Six inches of high density foam, and this happens? Mattress might sink in over time. This Parklane mattress is one that specializes in being an RV mattress, so there is no home version of this mattress available. It is a queen sized short mattress that is 74 inches long by 60 inches wide by 7 inches tall. It is rather thin compared to other mattresses, but perhaps you like your mattresses this way. There are a total of six layers inside this mattress. They are a quilted foam, a high density firm foam, cotton felt, a Bonnell innerspring, a foam base and finally non-skid fabric. The height of each layer is unknown at this time, but we cannot imagine them all being that wide. The non-skid fabric does a great job in keeping the mattress from moving off the frame of box spring. Regardless of how you toss and turn at night, the mattress will stay right where it belongs. For a mattress like this, we feel that it is too overpriced for what is being offered. The mattress isn’t that tall, and the layers inside are rather thin. It feel like they have cut corners, otherwise this is a very pricy mattress to buy. Furthermore, this mattress is rather overpriced. For what is offered here, the asking price is just too high. They’re expecting customers to be floored by all the nifty materials and technology inside a seven-inch mattress, but in actuality, the foam layers are just too thin to be any useful. You are essentially paying more for less, even with the innerpring layer that’s included. Mattress is too thin, comes with too many layers. Denver offers us this “Supreme Euro” mattress that is says to be both satisfying in comfort and support. It is 80 inches by 60 inches by 11 inches in size. It also is the most expensive mattress in this review, so is it worth the money? There are two layers in this mattress. The bottom layer is a nine inch high density foam for firmness, and the other is a two-inch Euro foam top for both comfort and for relieving pressure points. The all foam construction is great for couples. It doesn’t allow the foam to have much transfer of motion, which makes the mattress feel right for both partners until the morning. The top layer of the mattress is also high-density. You might get the impression that you will be sleeping on top of a large rock slab, but they go in a different direction, here, and rely on the quilt shape of the upper layer to comfort you and send you off into a deep sleep. At least you know that the mattress won’t sink in for being too soft. Considered a luxury-style mattress, its Euro top quilt feel very wonderfully across your body as you sleep. Once you find the right position, you will never want to move. This is the lightest mattress in this review, thus far. It weightly only 47 pounds, making it easy for one person to carry and maneuver inside and outside the RV. Light and supportive isn’t a combination that many people come to expect, but Denver manages to pull it off beautifully. There reportedly is a warranty that lasts for 10 years. This is plenty of time to make the most out of the mattress and check to see if it has any factory defects. If this mattress has something wrong with it, you will be glad that you have this warranty, especially with the price that it goes for. This mattress might just be a little too firm. With nine inches of high density firm foam, this really is a firm mattress more than it is comfortable. Overall, the mattress is 88 percent firm and 22 percent soft. If you previously slept on a mattress that was about 50/50 on firmness, then you will definitely feel a difference. If your body takes kindly to this type of mattress, then more power to you. Furthermore, the price is just a hard ask. This is a mattress that can work for you, sure. But when people just want a mattress that works for them, they aren’t looking to spend as much as this one in order to get it. They should consider reducing the price, even if it is rather large in size. ​Costs a lot of money. This final mattress for RVs come to us by Premier Sleep Products. It is 75 inches long by 60 inches wide by 8 inches high. It is an adequately priced mattress for RVs without you worry if you are spending too much. This mattress for RVs utilizes cool gel memory foam so that you are kept cool even in the stuffiest and warmest of conditions. It has a rather squishy, yet satisfying feel to it. It certainly doesn’t look or feel like any mattress that you might have seen before, but this can either be a good or a bad thing. The mattress is topped with an eight-way stretch fabric that feels good and is meant to massage the body as you sleep. As a comparison, it reminds us of textured or popcorn ceiling in the home. This is another great mattress for couples, as it works to reduce motion transfer among two sleeping bodies. This mattress for RVs comes with a solid 10 year warranty. If for any reason that the mattress comes with a problem, you could be eligible for a free replacement. This long-term warranty will give any RV owner a piece of mind. This mattress is resistant to bed bugs, dust mites and allergens and it works to keep away bacteria that is attracted to all of these life forms. Unfortunately, this is a firm, stiff mattress that can be rather difficult to find a good sleeping position with. What they call “medium” density might actually be pretty high density. While the surface feels soothing, the mattress itself doesn’t really provide enough to give you soft comfort along with its support. Are RV Mattresses different from the conventional mattresses? The short answer to this question is “yes”. RV mattresses are different from conventional mattresses, most commonly compared to size. TV mattresses tend to be much smaller so that they can fit inside an RV sleeping quarters. This means that individuals and couples will have less room to work with as they are sleeping. There are different sizes of RV mattresses depending on the class of RV that you own, however. Due to their reduced size, smaller mattresses tend to have more support than conventional mattresses, but manufacturers typically do their best to not skip on quality. For example, Zinus is a manufacturer of mattress that also makes mattresses for the home, and they typically make their mattresses for RVs in the same way that they make any other mattress, except for the size of it, of course. How are sleeping quarters built in my RV? There are two types of sleeping quarters that RV owners can use: A master sleeping quarters for the RV owner or leader, and sleeping bunks for other people what are sleeping on board the RV. A master sleeping quarters typically involves a mattress in the back of the RV that lines up with corners of the room to save space. Bunks are typically built in hallways between two rooms in the RV, with two or more built along the walls, so that people can walk in a path through the middle of the hall. Mattresses for these bunks are typically slim in width. What should be the dimensions for my RV mattress? The dimensions of your RV mattress should depend on the bed frame or box spring that you currently have in it. If you are also in search of a box spring or bed frame, you should take into consideration the size of your RV’s quarters and consider what kinds of beds would fit inside. Residential Queen: 60 by 80 inches. Short Queen: 60 by 75 inches. California King: 72 by 84 inches. Residential King: 72 by 80 inches. Short King: 72 by 75 inches. RV Bunk Beds: 28 to 42 by 72 to 80 inches. Short queen is the size that we have considered for your RV in this review. RVs for mattresses are also suitable for RVs, mobile homes, trailers, fifth wheels, or long haul trucks. What firmness level should I opt for? Mattresses can be firm, soft, or somewhere in the middle. The best type of firmness ultimately depends on your body. You might enjoy a firm mattress over a soft mattress, or vice versa. Firm mattresses are meant to be stiff and hard. This is so that your body can get the support it needs without your body being contorted as you sleep. Your back, legs, neck and arms will all be supported so that your entire body receives the support and rests normally. Soft mattresses are meant to be more comforting. This is so that your body doesn’t feel like you are sleeping on a flat table, for example. The downside to soft mattresses is that your body sinks down into the mattress. Not only can this feel unusual, but it also might be hard for you to get out of the bed. And of course, there are mattresses with a little bit of firmness and softness. You are really going to have to try each type of mattress yourself in order to judge which is the best for your body, but many owners cannot go wrong with a mattress being 50 percent soft and 50 percent supportive. 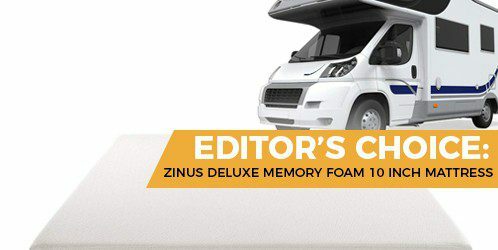 The best mattress for RVs is none other than the Zinus Deluxe Memory Foam 10 Inch Mattress. We have had experience with this mattress before, and it is a phenomenal mattress that offers benefits that no other mattress has. Most importantly, its green tea and active charcoal. Zinus’s mattress simply allows you to sleep cleaner and better, and the green tea and charcoal inside this matter work to give you just that. Not only is the support and comfort exceptional, but it works miraculously to remove toxins and bacteria from all around you. Sleep at night, and then wake up to feel better than before. This mattress is also available for traditional homes, but don’t assume that they sacrifice quality while sizing the mattress down. It is great to sleep on no matter what size you need. On top of it all, Zinus’s mattress sells at a price that any RV owner can afford, and it’s even more affordable than many of the “luxury” mattresses on the market. For a mattress that is not considered expensive, it is considered a real steal. This is the clear winner that you should be after. The only reason to not recommend this mattress to you is if you do not prefer to sleep on memory foam.